Questions like this may not exist in some workplaces, but at Bakehouse the amount of random statements, questions and requests that come up on a daily basis means that nothing surprises us anymore. So, when it comes to having knowledge about the queasiness of one of the largest mammals on the planet, we can put in our two pennies worth. For we happen to own an elephant, a life-sized grey-blue and purple elephant. Okay, she may be a massive marionette, but she is just as impressive as her living breathing cousins and she travels greater distances. She has had to travel long distance by sea on four occasions. Our elephant was made here in our workshop in Bristol and has enjoyed numerous outings. 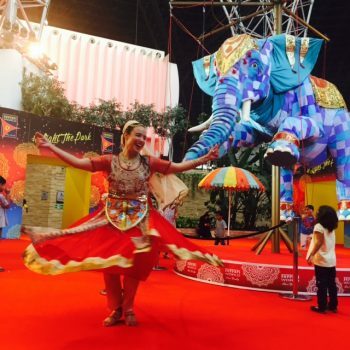 However, it’s her repeat trips to Abu Dhabi to star centre stage in a Bakehouse production celebrating Diwali in Ferrari World that has tested both her seafaring skills and our project manager, Katie Dane’s, logistical skills. Creating a show like we do in Ferrari World involves planning at all levels – scripting a story that will resonate across languages and cultures, composing a new piece of music, choreographing and rehearsing a slick show, creating new and intricate costumes, making and preparing the puppet and set in the workshop and…. getting it all there! Performers and crew (of seven) can fly of course (everyone loves a bit of long-haul movie time!) but what about our elephant? The process for transporting an elephant anywhere is obviously a bit of big job, with shipping, VISAs and customs to arrange not to mention pre-tour rehearsals in the UK, Health & Safety Assessments and of course looking after our cast and crew in this far-flung land. It takes four months to get her there, and three giant crates need to be packed for the journey, but no, our elephant doesn’t need a passport or any injections. The process is an interesting one, most importantly, of course, is making sure she isn’t stowed in the hold up-side-down! So, as to whether or not elephants get seasick I suppose we’ll never know, unless we place a hidden camera in her crate next time she sets sail. What we do know is that she has now got a taste for warm climates, so if anyone else fancies inviting her on a long-distance adventure do get in touch!